“5-inch Santoku, perfect for slicing, dicing, and mincing." Made in Germany with an ice-hardened stamped blade, this Sanoku knife is a worthy addition to any cook’s kitchen. It has a full tang that provides the best weight and balance, and three rivets for security. The handle on this blade is particularly comfortable. 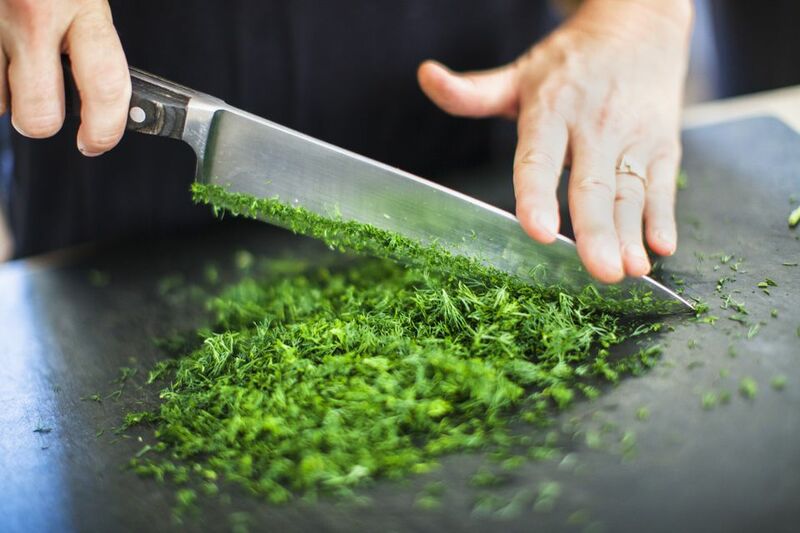 The handle’s shape positions the hand for proper cutting technique, so even new cooks will use proper cutting techniques. 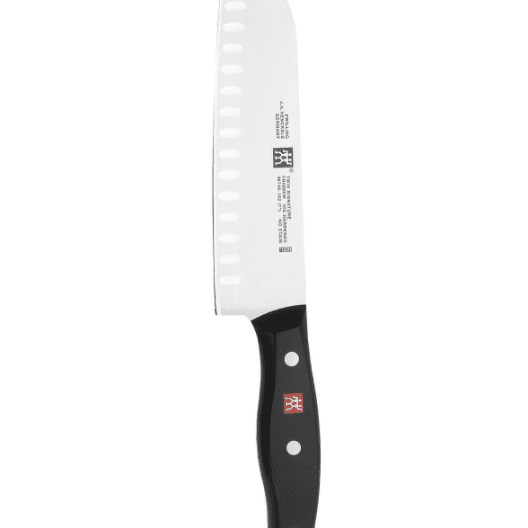 The 7-inch blade has a razor-sharp edge that makes it perfect for fine cuts, and particularly for cutting meat and fish into small pieces for stir-fry dishes or fajitas. Meanwhile, the contoured edge makes it idea of chopping vegetables and the hollow grind helps keep food from sticking to the blade. A good santoku at a budget price, this has a stamped blade with a granton edge. The handle is made from a patented material that’s slip-resistant and it is ergonomically designed for comfortable cutting. Because the blade is stamped, this knife is lighter in weight, which some cooks might prefer. This blade is beautiful as well as functional. While a pretty knife might not be your first priority, there’s something special about taking a knife from the rack that looks so stunning, with a tsunami rose Damascus pattern on the blade. It makes cooking just a little bit more pleasurable. But it’s not all about looks. This has a full tang and good weight, and it’s designed for impressive performance. This is made from 67-layer high carbon Japanese stainless steel that has a razor-sharp edge that makes slicing easy. This is hollow ground, so foods won’t stick, and it is tempered in liquid nitrogen for long-lasting performance. The handle is triple riveted for security, and even the rivets are decorative, with a 3-metal mosaic pattern. The handle is designed to be ergonomic, while the tapered bolster makes it comfortable to hold, with perfect balance. Made by a multi-generational family-run business that prides itself on engineering and innovation, this is sure to be one of the prettiest knives you’ll own. Of course you need one for yourself, but this comes in a box that would also make it a lovely gift for any cook you know. This santoku knife combines the traditional shape of the santoku with a curved blade that provides the familiar rocking action of western blades. Made from German stainless steel, it has an ergonomic textured stainless steel grip and balanced weight for the best control. Guy Fieri fans will appreciate his signature on the blade and the included storage sheath, but it’s not obtrusive, for those who prefer their knives to be unadorned. This should be hand washed and dried immediately. Great for cooks with small hands, or for small projects where a large knife would feel clunky, this 5-inch Santoku is perfect for slicing, dicing and mincing all the fruits, vegetables and meats in your kitchen. Safety touchpoints on top of the blade offer a more controlled rocking motion during cutting, and a comfortable rest for the thumb and index finger. The handle is antibacterial protected and has a contoured handle that will fit both large and small hands. The blade is made from German steel and is honed to a razor-sharp edge. It is rust resistant, durable, tarnish free, and easy to resharpen when needed. Maintenance couldn’t be easier since this knife sharpens itself every time you insert it into the sheath or remove it, so you’ll never need to use another sharpener to keep the knife at peak efficiency. The blade is made from high-carbon steel with an ideal cutting angle, and the handle is designed to be ergonomic and comfortable during use. The handle material is very durable, so this knife will last for many years. This should be hand washed and dried immediately. Most knives aren’t dishwasher safe, but this 7-inch santoku can handle the dishwasher after you’re done chopping, mincing, and dicing. The blade is made from Japanese steel that has a rust-resistant coating. That coating makes the knife safe at heats above the standard dishwasher temperatures, and it has even been tested in commercial dishwashers. Of course, you can also wash it by hand, if you prefer. The handle has a textured nonslip grip that is easy to hold onto, even when it’s wet.